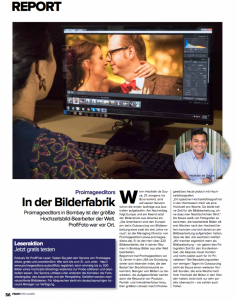 Profifoto is one of the leading photography magazines for professional photographers across Germany and other parts of German speaking Europe. The Profifoto team visited the ProImageEditors production Office at Mumbai, India in 2014 to learn more about the company, its services, its core business values and its people. This magazine article was published in April 2015 and talks about its findings during their visit.